The reason could be his wife's Russian citizenship. Ukrainian Defence Minister Stepan Poltorak has suspended the chief of staff and first deputy commander of the Ukrainian Navy, Capt 1st Rank Roman Hladkyy, the Odesa-based news website Dumskaya has reported, quoting sources in the Defence Ministry.Hladkyy is suspended for the period of the official investigation into certain financial and economic violations, as well as information about his wife Olena's Russian citizenship. According to Dumskaya, during the first two years after the war began, she continued to live with their children in the occupied peninsula. Hladkyy's daughter allegedly took part in swimming competitions on behalf of the Central Sports Club of the Russian Army. 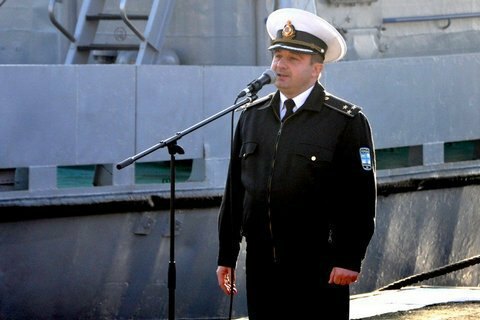 Hladkyy's first deputy Rear Adm Dmytro Taran will fill in for him. The Ukrainian Navy said on Facebok that Hladkyy was not suspended but "put at the disposal of the Ukrainian Defence Ministry to determine his future official position". It said this decision was taken after the Main Inspectorate of the Ukrainian Defence Ministry revealed fallacies in the performance of one naval units. Roman Hladkyy was born on 9 September 1975 in Vinnytsya Region. From 1997 to 2003, he was in charge of the ships Lutsk and Kirovohrad, from 2004 to 2013 he served on the Kostyantyn Olshanskyy (Konstantin Olshansky) large landing ship.